Your contractor ultimately shapes the success of your renovation plans – so picking the right one comes down to the way to prep and prime them for working on your space. You’re looking for a knowledgeable team that can put your fears and insecurities at ease. 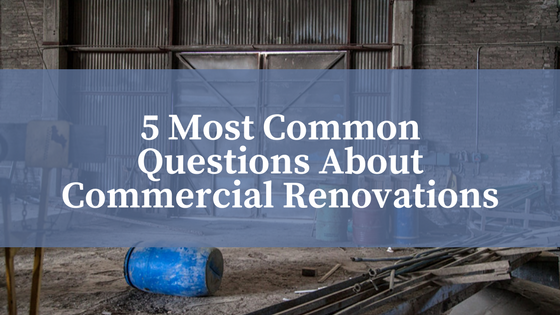 In this post, we’ll focus on the top 5 questions that most clients will ask when beginning a commercial renovation. Hands down, this is the most common question the vast majority of contractors will hear from eager clients – and understandably so. Commercial renovations are exciting prospects because they reshape and reimagine how your company and staff will spend their time at work. As exciting as a commercial reno is, this question is often met with unreliable, or overzealous schedules. Poor planning can lead to extra costs, rushed work, and re-adjusted completion dates. Most reputable contractors will ask to sit down with their clients to pre-plan as best they can, providing estimated arrival times for specialty materials, and estimates for how much time each stage of the renovation will take; a wise contractor will budget plenty of time for each stage to ensure that good quality work is completed – not so-so work that jeopardizes the integrity of the renovation. Schedules should never be set in stone, so try to maintain an open mind about a ballpark figure – your contractor means well by suggesting that good things come to those who wait. Second on this list of frequently asked questions is usually an inquiry about the cost of the project. A good estimate is the result of careful planning, a realistic mindset, and a feasible project. 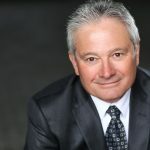 The hard truth is, most commercial renovations come with a few unseen hurdles to jump over, and as a result, costs can fluctuate according to material arrivals, staffing, and unforeseen problems with a variety of systems (plumbing, electrical, structural, etc). To avoid frustration or disappointment, many contractors will recommend that clients use a predetermined fixed cost, so the project has a maximum associated with it. A good contractor will do all in their power to help stick to a budget or reduce costs where they can. Can We Work in the Space as Construction Happens? Many offices opt to continue working within their spaces for as long as humanly possible during a commercial renovation to help reduce downtime – and understandably so. Hosting a crew of construction workers, contractors, carpenters, plumbers, electricians, designers and architects can get crowded, and messy. Reputable contractors will help you to set up a schedule that gives your business or organization enough time to pre-plan your Plan B. This is of course dependent on the type of job you’ve hired for. If your contractor only needs access to a specific part of the building, there’s a good chance that construction won’t affect the vast majority of your space – so if your staff can deal with some additional noise and dust, keep them working away. Contractors are great at barricading off their work site and keeping dust to a minimum anywhere else in the space. On the other hand, it’s never a bad idea to investigate alternative office space for your crew as construction takes place. While you may be able to physically occupy the space, your productivity levels may plummet because of noise and other distractions – and a construction zone isn’t a great place to host prospective or existing clients for meetings. Collaborative work spaces and pop-up offices are both great alternatives for keeping your staff on-track and motivated while construction is completed at HQ; this also gives the contractor and their crew the space, and capability to do what needs to be done without worrying about disturbing the flow of the commercial space. Yes. You do – for most things. Your contractor can help you to plan for which permits to apply for, and can help you to understand which types of updates you don’t need permits for. Let’s assume that you’re overhauling the whole space, complete with window replacements, structural changes, and drywall – you’ll likely need the whole kit-and-caboodle. Consult your local municipal office to inquire about what you’ll need – and remember that these permits need to be approved and displayed on a work site prior to beginning any type of construction. Many people think that their contractor is also a competent designer and architect – and that’s not always true. A contractor is a purpose-built entity that makes designs come to life through physical construction of blueprints and designs – they’re not always the ones who draw up the designs. Certain contractor groups will offer Design & Build services to eliminate the need to hire an outside design firm. This is especially advantageous for commercial renovations and offices because it puts the collaborative energy and cooperation between the contractor and the business itself; there’s no middle man to deal with as a result – design and construction are handled by one succinct entity. When you hire a more traditional contractor, the design process may be sub-contracted out, or you may have to find your own designer and pay them separately.